Every garden should include a strawberry patch. Strawberries are an all around favorite with almost everyone. Delicious when eaten fresh or preserved, they are very well worth the little work it takes to establish them. Versatile and adaptive, they can be planted in a bed to themselves, as a border around your flower garden, in hanging pots or raised beds and planters. Before purchasing plants, determine which kind you want. There are 3 basic types of strawberries. June Bearing Strawberries are the most popularly grown strawberries. They produce one crop of large juicy berries which all ripen within a few days of each other in June. During their first season after planting, remove all the blossoms in order to let the plants become established. Ever Bearing Strawberries - they do not bear fruit continuously as the name suggests. This variety produces a spring and a late summer crop. In the first season after planting, remove all blossoms that appear until the end of June. They will blossom again later in the year for a fall harvest. Day Neutral Strawberry varieties are the newest type of strawberry. They are as close as you can get to a truly ever bearing plant. Again, pluck the first set of blossoms that appear in the first year of planting to let the plants become established. After that, you can expect a continuous crop of small but very sweet berries throughout all but the hottest part of the growing season. The Alpine Strawberry is a cultivar of the day neutral strawberry and worth mentioning here for its unique ability to reseed itself. A small plant, it produces small red or white berries continuously and makes an excellent border plant or ground cover. Order your plants in the fall to arrive for early spring planting. Be sure to select disease resistant varieties. If possible, prepare the soil in the fall, incorporating a good amount of organic material. Strawberries like a rich soil and adequate fertilizer. They should be planted where they will receive as much sun as possible and sheltered from high winds. Before planting, immerse the roots in a bucket of water and allow to stand about an hour. Don't plant too deep - the crown should be level with or slightly above ground level. Immediately after planting, water individual plants with a solution of water soluble fertilizer to give them a good start. Water at least weekly thereafter if the weather is dry. For the juiciest berries, keep the soil slightly moist at all times, especially when fruit is forming. June bearing strawberries should be set 18 to 24 inches apart in rows spaced 4 feet apart. They will produce runners which should be allowed to root freely to eventually form a dense row of plants about 2 feet wide. 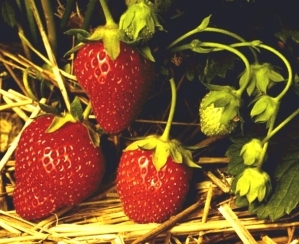 Everbearing and day neutral strawberry varieties should be set 12 to 18 inches apart. If planted in beds of two or three rows, leave a 24 to 30 inch wide path between beds to allow for easy access and cultivation. The plants should be maintained as single specimens, so promptly remove any runners that develop on these varieties unless you want to leave a few to grow and transplant the following spring. A mulch of straw can be used around these varieties to help keep the soil cool and the berries out of the dirt.